OVERLAND PARK, Kansas - April 30, 2018 - Bushnell invites attendees of the 2018 NRA Meetings & Exhibits Show to visit its booth (#7530) during the event, which runs May 3-6 in Dallas, Texas. Attendees can meet professional shooter KC Eusebio, television host John Scoutten, hunting celebrities Michael Waddell, Nick Mundt and Travis “T-Bone” Turner, and rock legend Ted Nugent. Eusebio is an IPSC/ USPSA and Steel Challenge action shooter who has been featured on the television series “Hot Shots.” Among his many accolades, he is a four-time Open World Steel Challenge Speed Shooting Champion and six-time Open U.S. National Steel Challenge Speed Shooting Champion. In 2010, Eusebio won the USPSA Handgun Nationals Open and he has won the U.S. IPSC Nationals, IPSC Australasia Handgun Championship and European Steel Challenge Speed Shooting Championship. He will appear in the Bushnell booth from 12 to 1 p.m. on Friday, May 4. Bone Collector’s Waddell, Mundt and Turner are household names to countless viewers across the globe and are arguably some of the most entertaining hunters in the world. 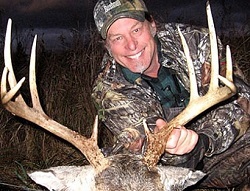 The trio host Outdoor Channel’s top-rated Bone Collector television show and have become synonymous with entertainment that also teaches hunting techniques for a variety of game species. These popular ambassadors will draw a crowd at the booth on from 5 to 6 p.m. on Friday, May, 4 and from 9 to 10 a.m. on Saturday, May 5. For more than a decade, Scoutten has both hosted Shooting USA and produced Emmy-nominated stories through his reports on the practical disciplines of the shooting sports, new products and home gunsmithing projects. Scoutten utilizes his wide knowledge of firearms and the industry in his reporting and tests new products along with his own shooting skills in matches across the country. Scoutten joins the booth on from 3 to 4 p.m. on Friday, May 4 and Saturday, May 5. Finally, international rock star, 2nd Amendment advocate and hunting dynamo Ted Nugent will make an appearance in the Bushnell booth on from 2 to 3 p.m. on Saturday, May 5. The host of Outdoor Channel’s Spirit of the Wild Television Series will be signing autographs and taking photos with fans. Bushnell will also be releasing several new products. Before or after these appearances, stop by the display and see a monumental shift in product assortment and design from one of the most recognizable and trusted names in precision hunting, tactical and recreational optics and accessories. For more information, visit www.bushnell.com.